The Miracle Express: Maxamillian No.8, is a fully restored vintage, 20 gauge, small-rail logging train, complete from engine to caboose. Maxamillian No. 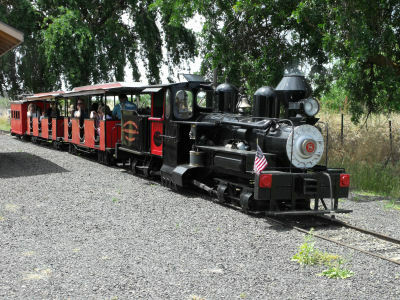 8 was built by Maker Locomotives in the 1940s, and lovingly restored by volunteers and the Miracle Ranch. 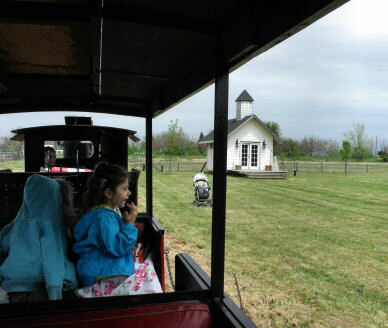 Train rides are part of the fun at Max's Miracle Ranch during any season, but especially when the orchards are in bloom, during the Harvest Festival, or at our Christmas Light Extravaganza. Your special event includes rides on the Miracle Express No. 8 or we can bring the Miracle Express No. 1933 or No. 3 to you with our Train on Wheels. Max's Miracle Ranch is located at 3476 Smith Avenue in Biggs, California, 95917. We are 20 minutes from Chico or Yuba City on Highway 99: turn west onto Rio Bonito and north onto Smith Avenue. Go 1/3 mile and you are there!